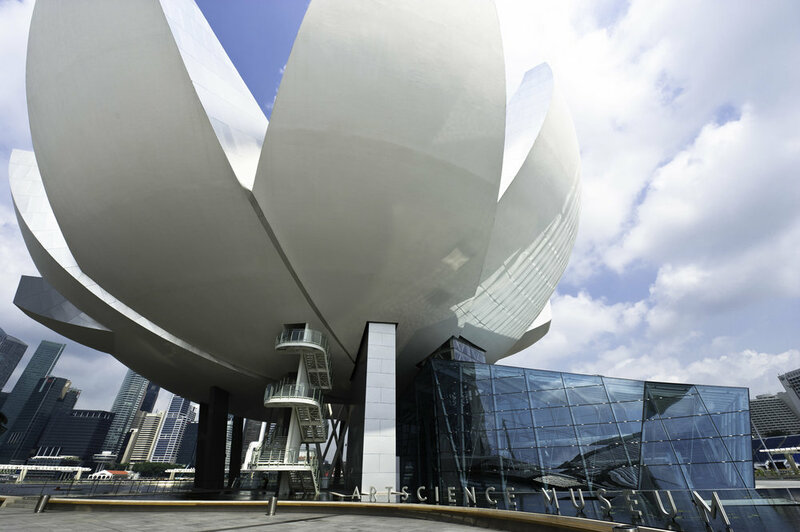 The ArtScience Museum's permanent exhibition, Future World - where art meets science, is a collection of cutting-edge digital installations that brings one into a world of art, science, magic and metaphor. It also hosts touring exhibitions curated by other museums. 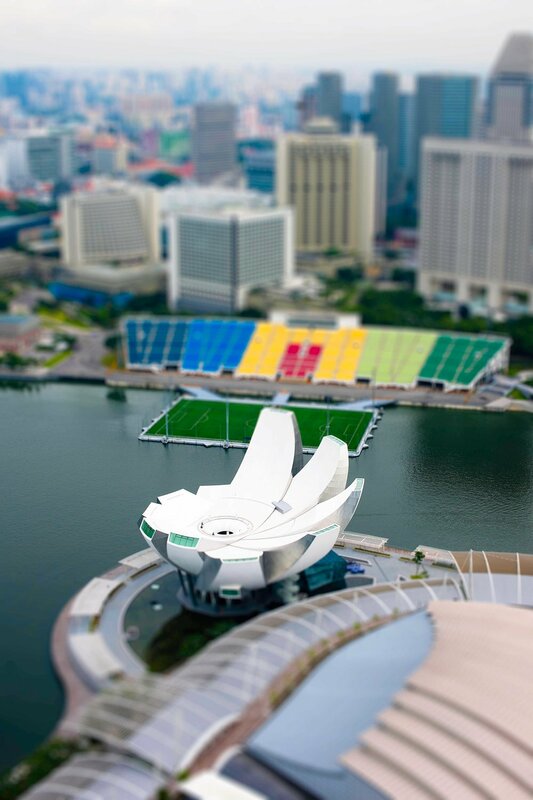 Designed by renowned architect Safdie Architects - Moshe Safdie, the building is composed of two principle parts. The base, which is embedded in the earth and surrounded by the Bay’s water and a giant lily pond, and a flower-like structure made of 10 petals, generated by the geometry of spheroids of varying radii that seemingly floats above the landscaped pond base. 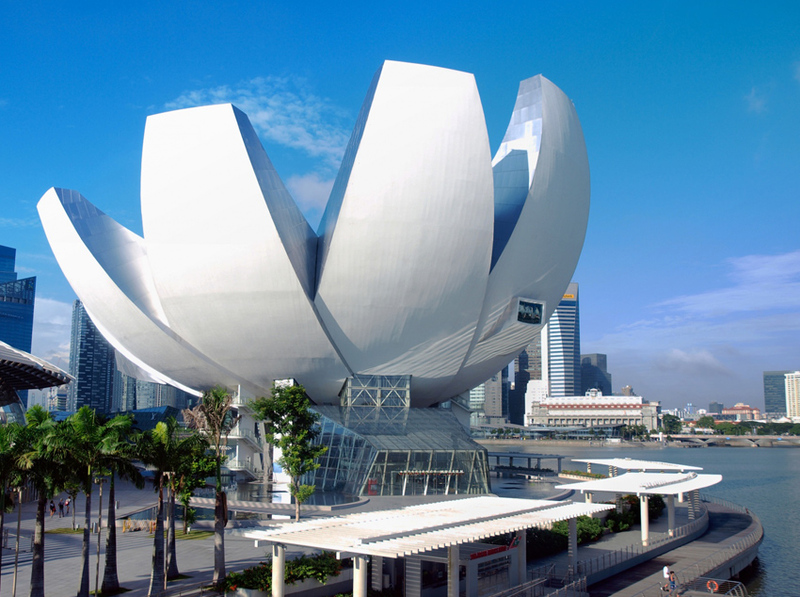 The petals rise towards the sky with varying heights, each crowned by a skylight which draws in daylight penetrating the base and illuminating the galleries within. The dish-like roof form collects rainwater and drains it through an oculus, creating a waterfall through the center of the museum that feeds an interior pond. The asymmetrical building structure reaches upward into the skyline as high as 60 meters and is supported by an elaborate steel lattice structure and ten columns tied down at its center by a basket - like diagrid - a sculptural centerpiece that accommodates the asymmetrical forces that the building's form generates. The result in an efficient resolution of the structural forces for the building, giving it a seemingly weightless quality as it hovers above the ground. 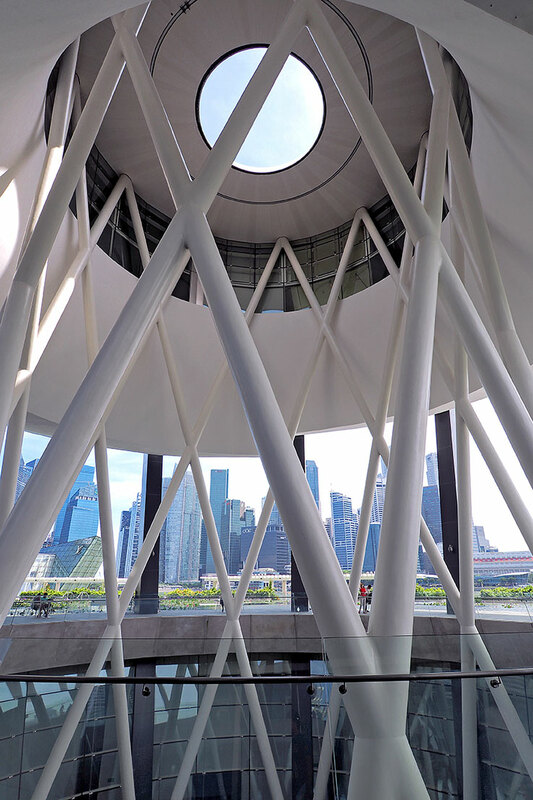 ArtScience Museum is a 1 minute walk along the Marina Bay Waterfront Promenade from The Shoppes at the Marina Bay Sands.